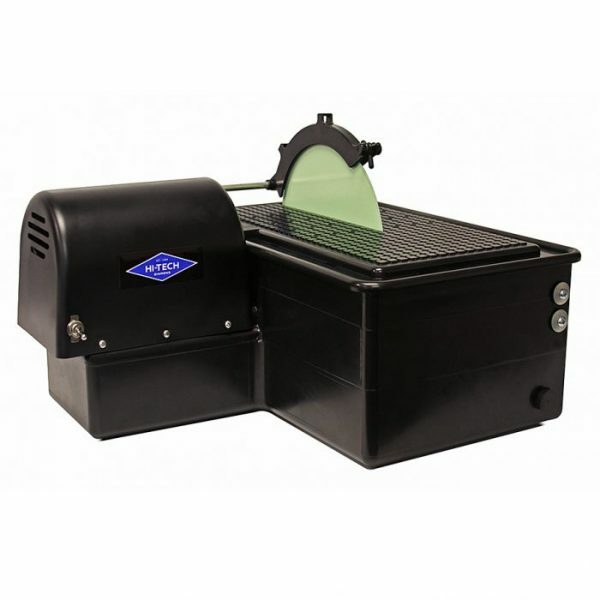 Our American-made 10″ slab saw is a powerful, economical saw machine that is used for slabbing larger rocks, minerals and glass into more manageable pieces. This saw includes TWO different types of 10″ saw blades to best-suit your cutting material; one notched diamond saw blade and one sintered diamond saw blade. 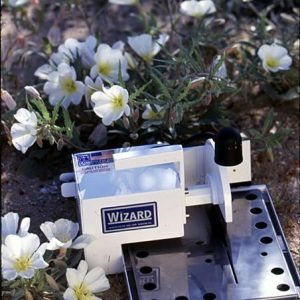 Saws are available with or without the saw vise accessory. The Hi-Tech Diamond 10″ slab saw is manufactured with a 5/8″ arbor and will accept any 10″ saw blade that has a 5/8″ arbor. 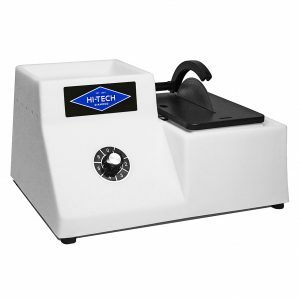 The large, removable saw table gives you plenty of room and allows for some carving ability, measuring 19-3/4″ L X 12″ W. The housing is made of unbreakable, cross-linked polyethylene that makes it rustproof and easy to clean. Installed in each slab saw is a 1/3 hp motor to provide plenty of strength for large cuts, delivering a speed of 1,725 rpm. The coolant reservoir is built right into the base of the machine and can hold up to 32 ounces of water. Simply drain the reservoir with the built-in drain plug, which makes cleanup fast and easy. The splash guard that comes with the machine keeps water off you and on your piece, making it easier for you to work. 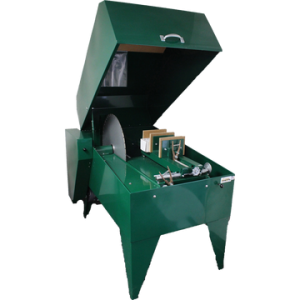 This Hi-Tech Diamond 10″ slab saw machine comes with TWO different types of 10″ saw blades to best-suit your cutting material. The notched diamond saw blade is designed for slabbing large rocks and minerals such as agates, jades and geodes, while the sintered diamond saw blade is designed for cutting large pieces of glass, topaz, quartz and fine agates. FREE UPS GROUND SHIPPING ANYWHERE IN THE CONTINENTAL U.S.A.!